ThisIsYourTrial is an improvised comedy show. Top comedians play lawyers prosecuting and defending charges set against YOU. We also do family shows! This Is Your Trial (PG) won an award. You’ve arrived to the online court room of This Is Your Trial. You are very welcome. When you come to our actual court, your role is that of juror. You’ll decide the guilt of those accused. You may be called to deliver evidence, a witness statement or put on trial. This Is Your Trial is an interactive and improvised comedy show. You get involved as much as you want. If you are facing charges, you’ll be provided with the best legal defence your ticket price can afford! Whether that’s Al Murray, Clive Anderson, Susan Calman, Josie Long, Tim Fitzhigham, Jess Fostekew, Thom Tuck, Deborah Frances-White, Marcus Brigstocke, Trevor Lock, Briony Redman, Daliso Chaponda, Rachel Parris or any of our regular top class representation. "A superb improvised show where comedians play lawyers prosecuting and defending charges against you. Nominate whoever you’re attending with for a previous misdemeanour and sit back and enjoy your revenge if it’s one of the cases chosen. Seriously good fun. Book ahead." 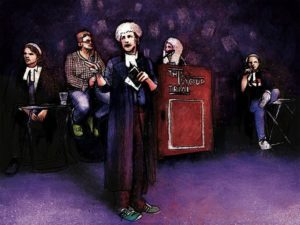 "Having attended more than my fair share of This Is Your Trials and enjoying every single one of them, I could not deprive our London Young Lawyers Group members of such joy; who better qualified to laugh at the legal industry?… David and his team were fantastic to work with and put on a great show thoroughly enjoyed by all – especially those who had the pub landlord, Al Murray, as their defence Barrister! A truly hilarious show!" "As fast on their feet as the very best barristers, but a lot funnier and with more extravagant wigs!" "This is your Trial is a fabulous concept - turning the legal system into a fun night out - even if you're on trial! I've been several times. Enjoyed equally by my lawyer and non-lawyer friends!"